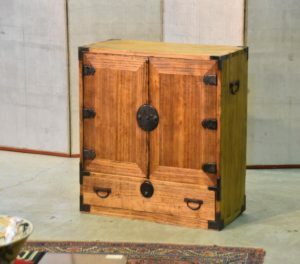 This is a good quality Paulownia chest, everything works like new. We have keys for the drawers. The last photo is before being cleaned and french polished. $50 delivery in Sydney City, $100 to outer Sydney, $180 Blue Mountains, $330 to Melbourne or Brisbane, $650 to Perth, Cairns and Darwin. $400 to Adelaide and Tasmania. Please email for other areas or pick up from the warehouse. Interstate delivery is 2 to 4 weeks approximately. SKU: 13386. Categories: Chests, New Arrivals, Wedding Chests.